BROOKLYN BRIDGE FLOOR MAT by Accent Plus home decor, jewelry, decor, decorations, electronics, fountains, floor mats, art glass, vases, garden essentials, fireplace screens. Let the hustle and bustle of New York City rest at your feet with this colorful floor mat. 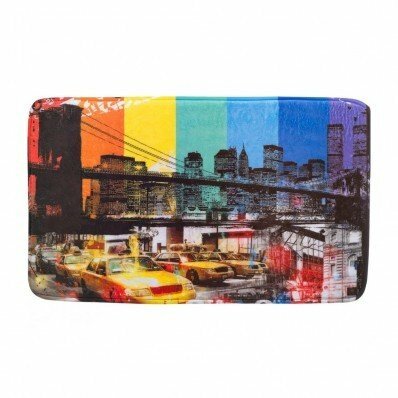 The Brooklyn Bridge scene is set on a rainbow-striped background that will add some eclectic style to your room. Made from polyester and printed digitally. Machine wash cold; do not bleach; do not iron; do not tumble dry; do not dry clean. Material(s): POLYESTER MEMORY FOAM POLYURETHANE FELT. Weight 0.4 pounds". Dimensions 29" x 17" x 0".